Lauren Singer, caught in a rundown, escaped and later scored as Coach Lori Solazzo looks on. 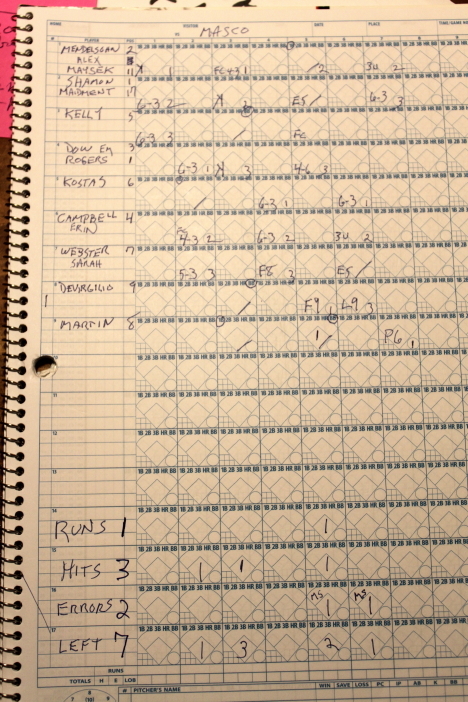 (Newburyport) Last year these two teams met at Cashman Park in early April and there were thirty hits and Masconomet left with a 9-6 win in nine innings. Not this time. 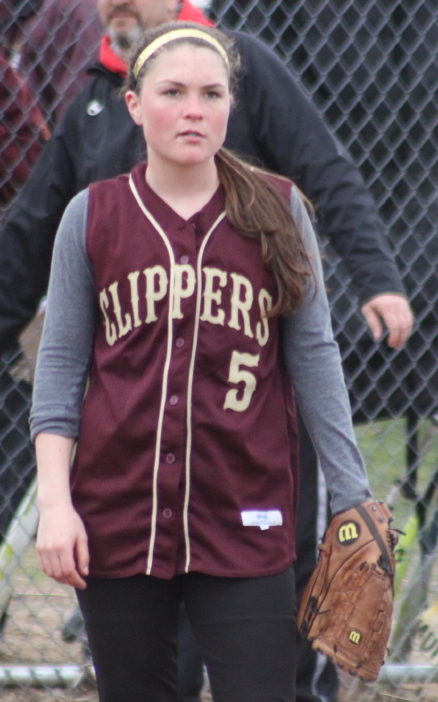 The hits were scarce (eight) and the Clippers won, 4-1, in Cape Ann League action on a cold/bleak Thursday afternoon in Newburyport. 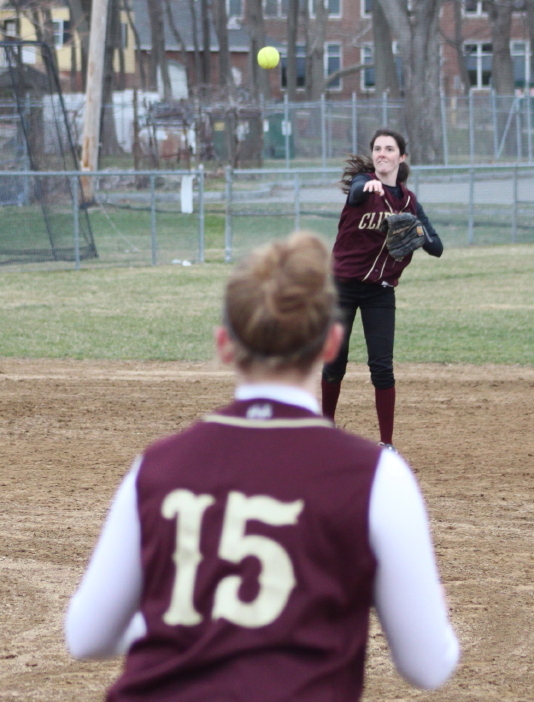 Newburyport (3-0) is off to a perfect start with Victoria Allman showing that she can handle the every-game pitching assignment. 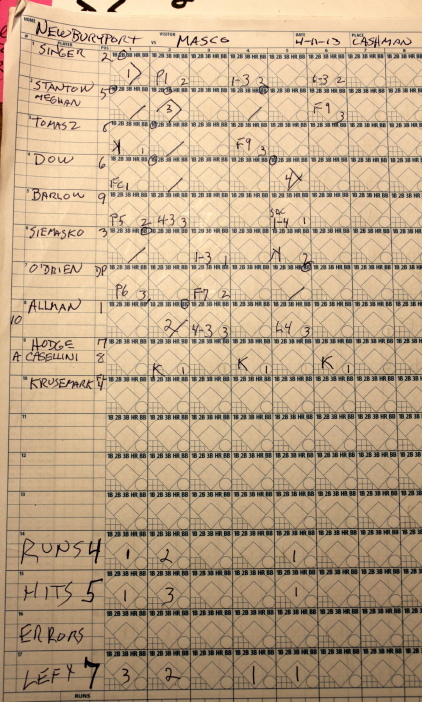 Victoria gave up three singles and one unearned run. This was the opener for Masconomet. They did have several scrimmages leading up to this game. The Chieftains were 17-3 last season under first-year Mike Gibeley. Mike was named coach-of-the-year for his terrific season. Pitcher Rachel Shamon leaves the game with an injury. 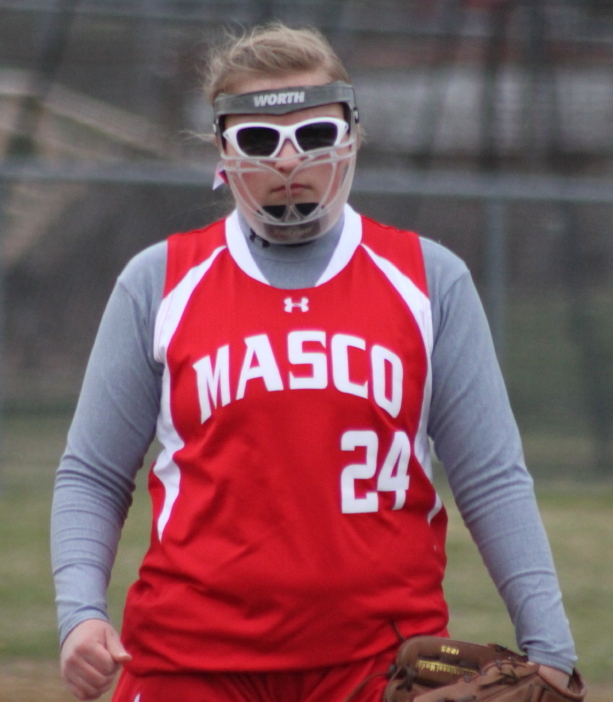 Rachel Shamon (CAL D1 player-of-the-year) started for Masco but went out after 2 1/3 innings after getting a finger in the way of a ground ball. Emily Dow came on to pitch one-hit ball the rest of the way. The Clippers picked up a run in the first, two in the second, and another in the fifth. In the first, Lauren Singer doubled to right center and reached third after a liner by Meghan Stanton was dropped by Rachel Shamon (pitcher). Meghan took second uncontested. Kendra Dow then grounded back to Rachel. 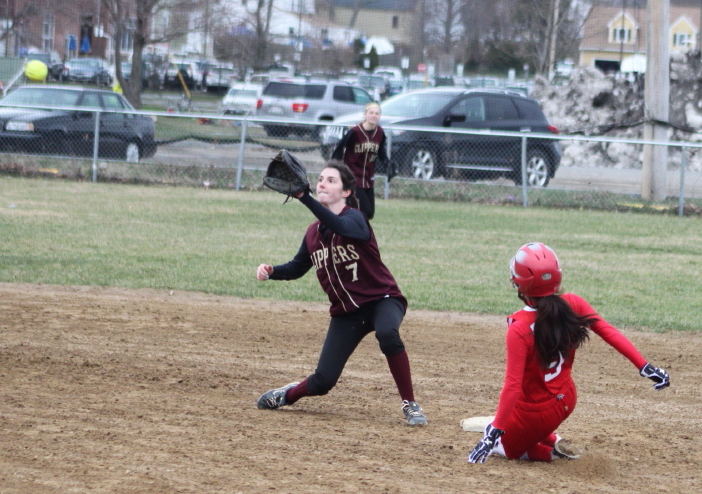 Rachel faked the throw to first then tried to get Lauren Singer off of third. She couldn’t and the bases were loaded with one out. Carley Siemasko worked Rachel for a walk and the Clippers led, 1-0. In the second, Victoria Allman walked (Molly Stanton ran for her). Meghan Stanton lined a 2-out triple over the head of leftfielder (Sarah Webster) scoring her sister. 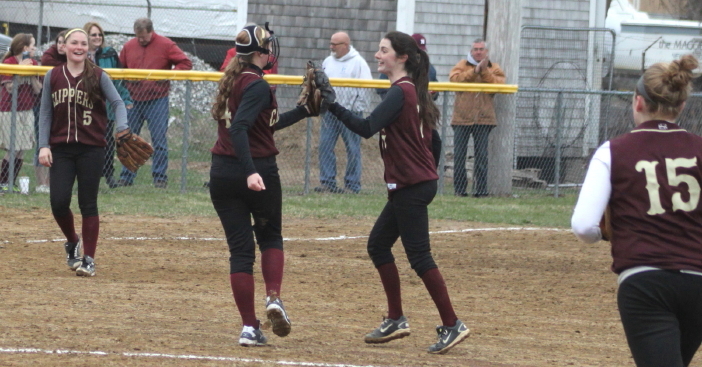 Lea Tomasz singled to the right of second base driving in Meghan and giving Newburyport a 3-0 lead after two innings. The Chieftains picked up their lone run in the fifth. Sammy Martin walked and Alex Mendelsohn reached on a single to deep short. Rachel Shamon’s grounder to third (Meghan Stanton) went through the sophomore’s legs allowing Sammy Martin to score an unearned run. The Clippers got that run back in the bottom of the fifth. Kendra Dow doubled to right and reached third on Casey Barlow’s sacrifice grounder. Shelby O’Brien walked but on ball four the ball got away from catcher Alex Mendelsohn allowing Kendra Dow to slide in with the fourth Newburyport run. Senior shortstop Kendra Dow had two hits, scored a hustle run, and handled seven grounders flawlessly. 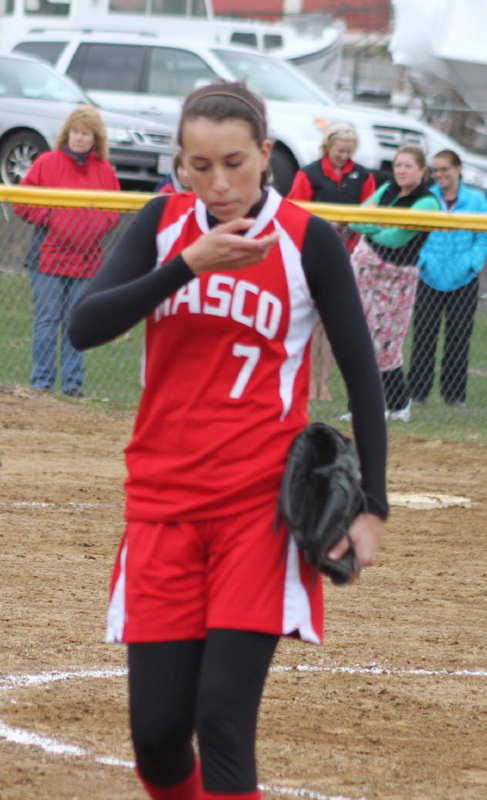 Masco second baseman Erin Campbell made a terrific backhand stab of Vicki Allman’s liner to end the fifth inning. 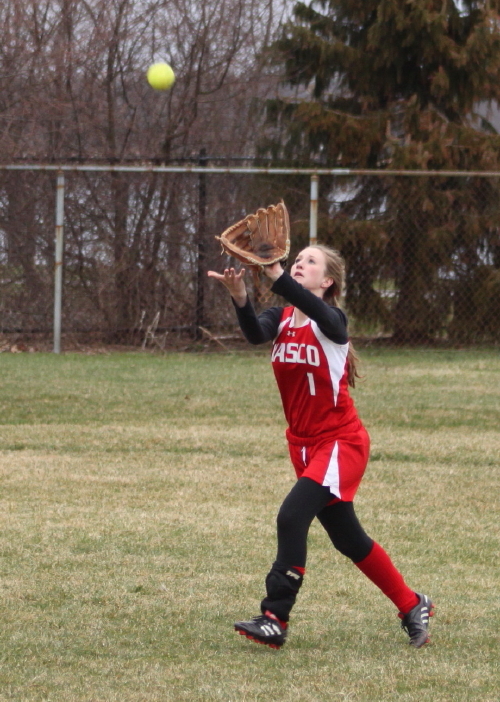 Outfielders Lea Tomasz and Ashley Hodge collided in the fourth inning but Lea came away with the catch. 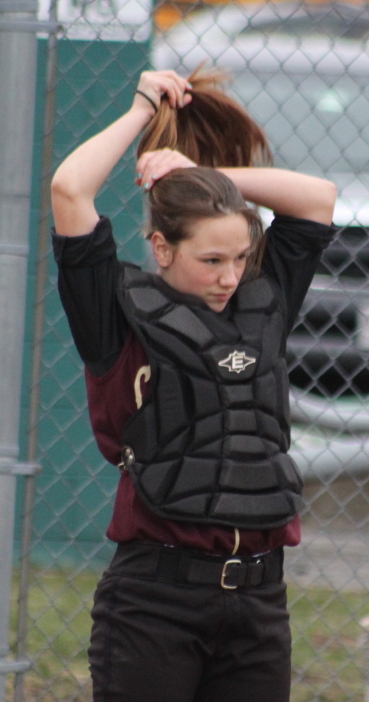 Sophomore Meghan Stanton had two hits, an RBI, and scored a run. 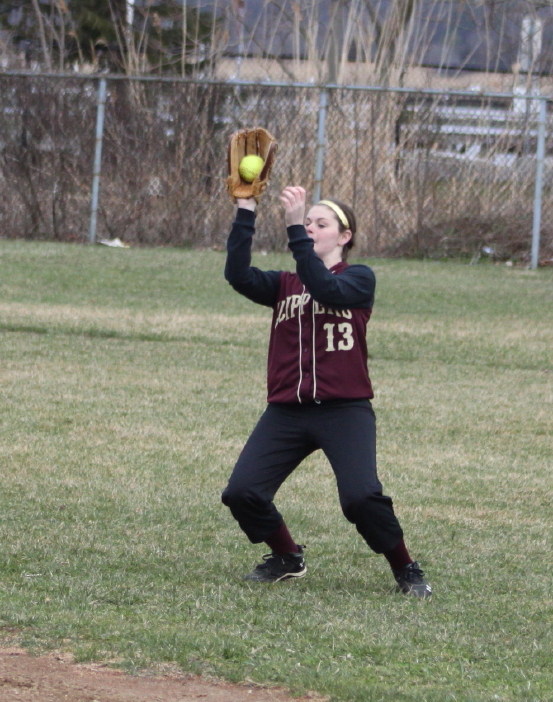 Sophomore Lauren Singer had three hits off pitcher Rachel Shamon last year. 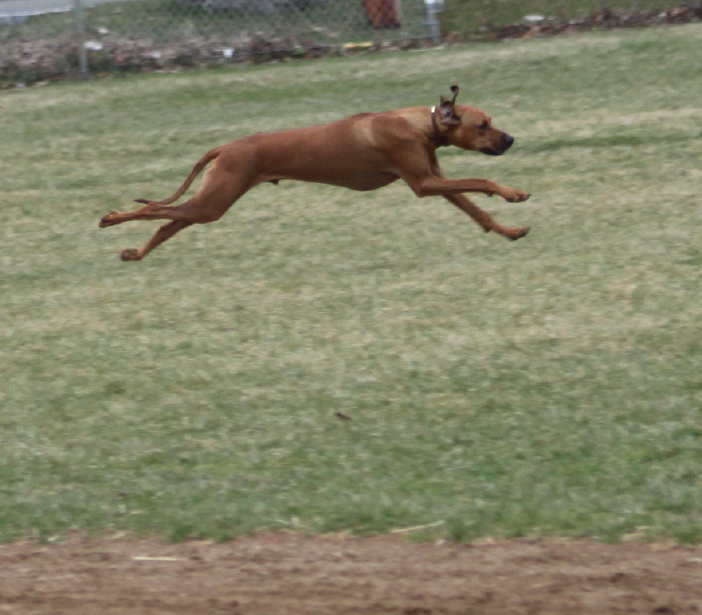 The quickest feet were shown by Angus as he circled the field then raced back to obedience school for a lecture. 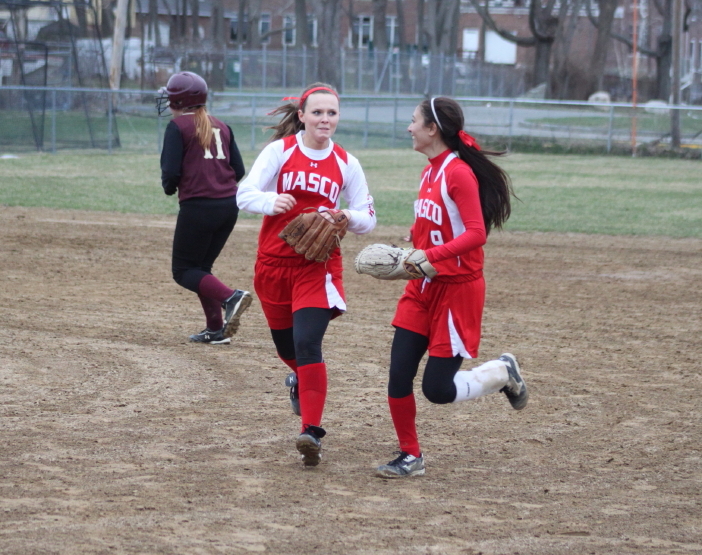 Masco and Newburyport will meet again on May 13th at Masco. The Chieftains next game will be hosting Triton next Wednesday. Newburyport will face an excellent North Reading team on the road next Wednesday.